Often, the delight is in the details. 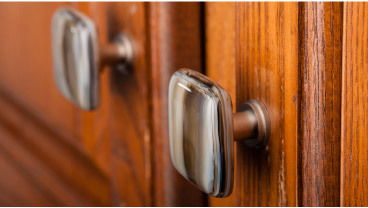 Sietto doesn’t make the cabinets for your kitchen, but it supplies the pulls that makes your cabinets shine. And what pulls they are! Sietto makes a staggering variety of glass pulls in the heartland of our country, Chicago, Illinois. How Sietto came to manufacture its pulls in the City of Broad Shoulders is a story worth telling. At the center of that story is Andrew Kates. Kates graduated from the University of Michigan in 1985 and like many of us with a freshly minted college sheepskin, he didn’t have a clue what he wanted to do with his life. So of course he moved to Chicago, opened up the phonebook, and began calling businesses that might offer him a job. He must have started from the back of the phonebook because within a few weeks he was working at Xerox. He spent 10 years at Xerox and for the most part really enjoyed it. But man cannot live by office equipment alone. Kates needed a change so after ten years of peddling copiers Kates decided to try his hand at commercial real estate. Bad choice. He spent seven of the worst years of his professional career leasing office space. So he quit. After a brief stint discovering that his dream of opening a delicatessen was in fact a pipe dream, Kates was back to square one career wise. Then one day Kates walked into Jayson Home & Garden, a home furnishings store on Clybourn Avenue in Chicago, and saw the coolest mosaic table that he had ever seen. He decided that he was going to learn how to make a table like that. So he took a class at the Lill Street Art Center and began making mosaic tables. And they were good. Kates was pleased. But there were a few steps between mosaic tables and Sietto pulls. The first occurred when Kates realized it would be difficult to make a living selling mosaic tables. The second occurred when a fella admiring one of Kates’ mosaic tables at an art fair suggested how cool a mosaic table would look if you could somehow melt the glass together. Kates pondered this observation for quite a while, but then decided to try his hand at fusing glass. After making a number of fused glass products, including chess boards, he came to the conclusion that a smaller fused glass product would be more simple to craft. He chose cabinet hardware. And in June of 2005, Sietto was born. Virtually everyone that Kates knew thought he was certifiable to try to make a living crafting fused glass cabinet pulls. Let them scoff Kates countered. He determined that he definitely wanted to work for himself. And he believed, and still does, that one can accomplish anything they want if they have the passion and perseverance to see their vision through. It’s been ten years since Kates officially launched his business, and Sietto’s products are in over 150 showrooms nationally, as well as on numerous online websites. Kates created the name for his firm by combining two Italian words, “solido” and “schietto.” Solido means solid and schietto means straightforward, both of which are the very essence of what Sietto is all about. Kates is proud of what Sietto has become, but also understands that there is a long way go. New styles of hardware to make. New ways to market their product. Ever since he started the business, Kates’ goal was to create the most beautiful hardware in the world. And that goal remains.